Try out this recipe for Roasted Beet, Olive & Sundried Tomato Flatbread instead of a full-fledged ooey gooey tomato pizza pie for a surprising new twist on Flatbreads! In food processor, combine beet, garlic, olives, sundried tomatoes and spices (except for Herbs de Provence) till a choppy red veggie paste forms. 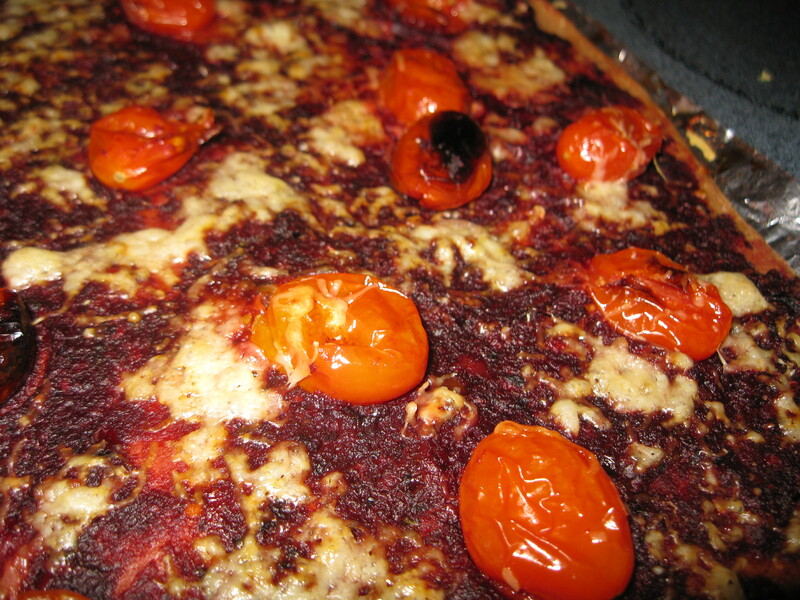 Roast grape tomatoes separately in oven 15′ at 425F. Flatten/roll out pizza dough on well oiled or lined baking sheet. Pre-bake crust alone for 10min 425F. Spread on red veggie paste and dot with roasted grape tomatoes. Sprinkle with shredded cheese of your choice & with Herbs de Provence. Bake 10-15min until cheese is melted and crust is cooked through.